If you care about nothing else, I have a new game. You can play it here. I would like to commission someone to make a Twine game called "Žižek Makes a Twine Game." Takers? @ckunzelman? In the ensuing conversation, I agreed to do it. My first game, after all, was a Twine game–more than that, it was based on thoughts that I had after reading Bogost’s Alien Phenomenology. Working in Twine, and I mean “working” in that I fiddled with CSS, inserting photographs, and other basic Twine stuff, gave me a new appreciation for the work that I see in the medium. I’ve played quite a few Twine games (mostly thanks to TwineHub‘s amazing cataloging). The content of those games, whether they are personally-oriented or not, is sometimes incredibly powerful, and the fact that we have an accessible tool that lets those stories run free in the world in an accessible format is nothing short of breathtaking in the context of our painfully masculine shootydude games and general AAA ennui. My proper, more-than-two-minutes foray into Twine, “Slavoj Žižek Makes A Twine Game,” has given me a very intense appreciation for projects like Depression Quest or anything that Porpentine has ever touched. I don’t have a programming background, and my command of HTML and CSS is limited to vague customization of Livejournal pages ten years ago. Making Twine bend a little was hard for me; the ways in which other creators are taking it to its absolute limit is humbling. Of course, I’m not even close to the first person to say these kinds of things, and you should really be reading people like Anna Anthropy or Andrew Vanden Bossche on the subject. In any case, Twine is a tool for revolt in story–anyone can turn anything they think into a game with the most basic knowledge of how to click, drag, and type. It works in a similar register for aesthetics–if you can draw it, photograph it, ASCII it, hack it together from glue and scraps and scan it, sculpt it, or anything else, you can put it into a Twine game. I know what you’re thinking. What mountain of generosity must one strip-mine to facilitate such questionable benefit, and how can I stop it from happening again? Well, securing my station as ‘patron of the arts’ only cost me: a copy of Žižek’s Less than Nothing, which I ran over repeatedly with my car; a t-shirt of my design; and five pounds of cheese balls. Here I proved less successful than Cameron. It turns out to be impossible even to scuff Less than Nothing, despite multiple passes under my car tire. And when I saw how large a quantity just one pound of cheese balls represents, I couldn’t in good conscience subject him to five times that quantity. I have agreed to be indebted to Cameron in this regard, an arrears I shall also allow him to transfer on my behalf and at my own peril. 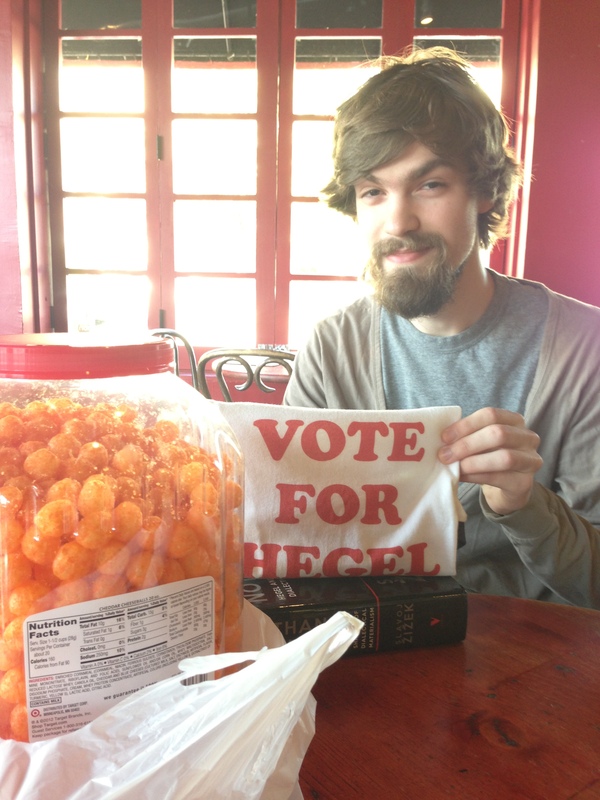 As for the t-shirt, I asked myself the obvious question: what would Žižek wear (besides his standard-issue dark tee). Like healthcare or Marxism, the result can be shared by everyone — for a price. As Žižek says, if you have a good theory, forget about the reality. Finally, a picture to prove that loot was delivered in fulfillment of the agreement. I am also very open to suggestions about what I should take in place of the other 4 pounds of cheese balls. This entry was posted in A Game I Made, Video Games and tagged ian bogost, Slavoj Žižek, twine, video games. Bookmark the permalink.